NASA has selected the potential next destination for the New Horizons mission to visit after its historic July 14 flyby of the Pluto system. The destination is a small Kuiper Belt object (KBO) known as 2014 MU69 that orbits nearly a billion miles beyond Pluto. This remote KBO was one of two identified as potential destinations and the one recommended to NASA by the New Horizons team. Although NASA has selected 2014 MU69 as the target, as part of its normal review process the agency will conduct a detailed assessment before officially approving the mission extension to conduct additional science. Like all NASA missions that have finished their main objective but seek to do more exploration, the New Horizons team must write a proposal to the agency to fund a KBO mission. That proposal – due in 2016 – will be evaluated by an independent team of experts before NASA can decide about the go-ahead. Early target selection was important; the team needs to direct New Horizons toward the object this year in order to perform any extended mission with healthy fuel margins. 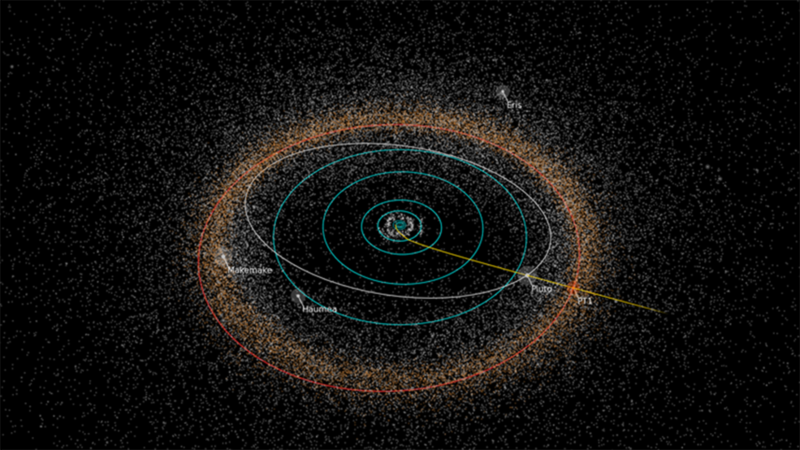 New Horizons will perform a series of four maneuvers in late October and early November to set its course toward 2014 MU69 – nicknamed “PT1” (for “Potential Target 1”) – which it expects to reach on January 1, 2019. Any delays from those dates would cost precious fuel and add mission risk. New Horizons was originally designed to fly beyond the Pluto system and explore additional Kuiper Belt objects. 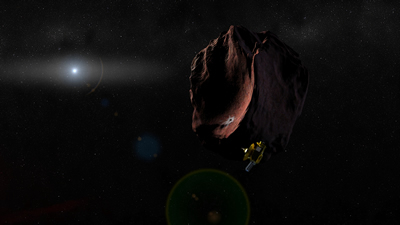 The spacecraft carries extra hydrazine fuel for a KBO flyby; its communications system is designed to work from far beyond Pluto; its power system is designed to operate for many more years; and its scientific instruments were designed to operate in light levels much lower than it will experience during the 2014 MU69 flyby. 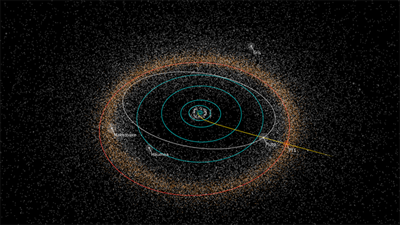 The 2003 National Academy of Sciences’ Planetary Decadal Survey (“New Frontiers in the Solar System”) strongly recommended that the first mission to the Kuiper Belt include flybys of Pluto and small KBOs, in order to sample the diversity of objects in that previously unexplored region of the solar system. The identification of PT1, which is in a completely different class of KBO than Pluto, potentially allows New Horizons to satisfy those goals. But finding a suitable KBO flyby target was no easy task. Starting a search in 2011 using some of the largest ground-based telescopes on Earth, the New Horizons team found several dozen KBOs, but none were reachable within the fuel supply aboard the spacecraft. The powerful Hubble Space Telescope came to the rescue in summer 2014, discovering five objects, since narrowed to two, within New Horizons’ flight path. Scientists estimate that PT1 is just under 30 miles (about 45 kilometers) across; that’s more than 10 times larger and 1,000 times more massive than typical comets, like the one the Rosetta mission is now orbiting, but only about 0.5 to 1 percent of the size (and about 1/10,000th the mass) of Pluto. As such, PT1 is thought to be like the building blocks of Kuiper Belt planets such as Pluto. Unlike asteroids, KBOs have been heated only slightly by the Sun, and are thought to represent a well preserved, deep-freeze sample of what the outer solar system was like following its birth 4.6 billion years ago. “There’s so much that we can learn from close-up spacecraft observations that we’ll never learn from Earth, as the Pluto flyby demonstrated so spectacularly,” said New Horizons science team member John Spencer, also of SwRI. “The detailed images and other data that New Horizons could obtain from a KBO flyby will revolutionize our understanding of the Kuiper Belt and KBOs.” The New Horizons spacecraft – currently 3 billion miles [4.9 billion kilometers] from Earth – is just starting to transmit the bulk of the images and other data, stored on its digital recorders, from its historic July encounter with the Pluto system. The spacecraft is healthy and operating normally.